Recipient Sarah Ahern with Rónán Ó Muirthile, Head of Film & Media at IADT & Nick Costello of Warner Bros. Ireland. 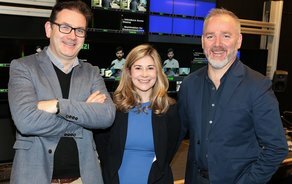 Warner Bros. Ireland has awarded a scholarship to Sarah Ahern, an MA Screenwriting student at the National Film School at Dublin’s Dun Laoghaire Institute of Art, Design and Technology (IADT), which was announced by Josh Berger, President & Managing Director, Warner Bros. UK, Ireland & Spain. Sarah is a screenwriter, filmmaker, and is currently the Projects Manager & Programmer at Virgin Media Dublin International Film Festival (VMDIFF). She currently programmes Fantastic Flix (the children and young people's strand) and the Short Film strand at the festival. She has, also produced the Immersive Stories VR Conference and coordinated numerous festival screenings and side-events. Sarah's short film ‘Caught’, screened at Cork Film Festival 2015, she has produced four shorts for a comedy sketch group called The Lads and written three short form plays: ‘Elephant’, ‘Franken 20’ and ‘Search’, which were performed at Smock Alley Theatre. Warner Bros. has a storied film-making history in Ireland, most notably the 1996 production of Michael Collins, which became the country’s top-grossing film on release and still remains the highest grossing Irish film of all time. The film’s Academy Award-winning director, Neil Jordan, is also behind other Warner Bros. hits including ‘Interview with a Vampire’ and award-winning film ‘The Butcher Boy’.